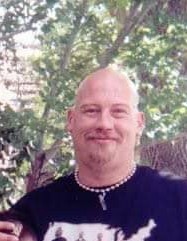 Johnny Lee Hobson, 51, passed away October 26, 2016. He was born in Pueblo on October 4, 1967 to John and Kathy Hobson. He is preceded in death by his daughter, Heather. Johnny loved to listen to Hard Rock, was a jokester and a joy to be around. He is survived by his children, Dymond, Alex, Michael, Andrew, Demetrius,Saffire and Jonna; mother of his children, Tracey; 3 grandchildren. At his request, cremation has taken place. Celebration of life at later date.